Outlook is one of the most well known email clients in the world: ranked 4th, as of this writing, in total market share amongst global users. Though it was born as a Microsoft product, its usage has grew over the years into other OS, such as Apple’s Mac OS X. Outlook in Mac has everything you may want from an email client… unless you want to migrate your mails , that is . As great as it is, OS X is not the only one around the block. Windows, for one, (a big one), is still as relevant as it has always been. And Outlook still goes hand in hand with it; hence, you may face the necessity to migrate the information contained in your emails from client to client, OS to OS, OS X to Windows — without losing any in the process. But there’s a problem. Outlook in Mac exports its mails into . olm files, while Outlook on Windows only recognizes .pst ones . Time ago, we came up with a solution : Gladwev OLM to PST Converter Pro, a product designed to convert one into another as seamlessly as possible. And yet, as great as it was, (and as much as our customers loved it)… we weren’t as happy with it as we felt we could be. So we pushed it further. And so, Outlook Mac to PST Converter Ultimate was released. With Outlook Mac to PST Converter Ultimate, . olm files won’t be needed whatsoever. Our product is able to access the Outlook Mac database identity and start migrating mails directly, without any need for exporting .olm files. Saves you a lot of man hours in Outlook Mac mail migration process. Exported . olm files could only contain so much, often relying in your default calendar and contact info. Our new product delves deep into them, converting all calendars into ICAL files and contacts into VCF ones. As convenient as it is, generating an .olm file often failed to assure both safety and accuracy in retrieving all your mail sand header info. Outlook Mac to PST Converter Ultimate skips that step entirely. Our product can take as many as 60 address fields from your address book into account while migrating your mails. Not only will it migrate your info, but your contacts as well. Content can take many forms, from plain english to foreign languages, double-byte characters, (Arabic, Japanese and Chinese), and Unicode content. But Outlook Mac to PST Converter Ultimate has you covered. Sometimes, emails contain other emails. In technical jargon, that’s called nesting , as in a hierarchy of email replies one inside the other . Outlook Mac Mail Data Converter makes sure it stays in place. If the first one was gold, this one’s a true diamond. But don’t believe us just by word! Go find out — there’s a free trial below. Give it a try! What is limited in Outlook Mac to PST file Converter Ultimate Trial Version ? It’s a fully functional copy of the app and lets you experience the Outlook Mac to PST file conversion process first hand. Only limitation is while exporting the converted data, the app exports only 10 mails each folder while using Trial version of our App. 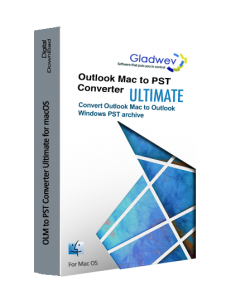 Gladwev Outlook Mac to PST Converter Ultimate is the only app that works directly on Mac. You can convert directly from Outlook Mac Database or Identity files or alternatively from any backed up .olm archives . You can copy the output .pst file over to the PC on a Portable USB disc drive or over the network as and when you get access to your new PC. Add the PST file to outlook and you are all set. Do I need to Wait for the Physical product to be shipped to start with Outlook Mac to pst file conversion process ? No, not at all, our software is a Digital Download as we care for mother earth, the software can be downloaded instantly. You will receive a License key on your email address specified while placing the order with in 15 minutes. You are all set to proceed with conversion, after Activating your Outlook Mac to PST Converter Ultimate license.